More rain, and a tummy ache. Oh and some people just never change. The school debate club is accepting new members and Mo Sheng is one of the lucky few who got selected. Of course, this makes someone (hint: it’s not Yi Mei) fuming with anger because Mo Sheng is a chem major and not a law student. We all know though that this girl is probably mad because she doesn’t want more girls fighting for Yi Chen. Yi Chen comes to Mo Sheng’s defense and says the club needs to develop and gather members from all backgrounds. The girls catches Yi Chen in the middle of the street and tells him he is being selfish for inviting his girlfriend in. Of course Yi Chen tells her off. Wait, did she say girlfriend? If you know, then why are you here trying to cause problems? this is some popular stretch of the campus! Looks like Yi Chen won, because Mo Sheng and her roommate report to the debate club the next day and the girl from before is all up in her face about it. First, she gives Mo Sheng a lecture about how being in the club is serious bizniz and that any thoughts about dating should be avoided. Our Mo Sheng is not scared though, she replies with “oh, okay, I will make sure to just pursue Yi Chen when we are outside of the club then!” Hahahahah!!! Nice one! Any guess who this crazy girl is yet? That’s right, she is the college version of Xu Yin. So Yi Mei was totally right in episode 1 when she wondered if Xu Yin used to have a crush on Yi Chen. In any case, Xu Yin orders Mo Sheng to go pick up forty lunch boxes for the club. Mo Sheng can’t carry all the boxes by herself, so she tells Yi Chen and friend to look after the boxes while she delivers some first. Yi Chen’s friend teases Yi Chen about it and says how Xu Yin must be doing this to get back at Mo Sheng for her comment earlier. But of course! 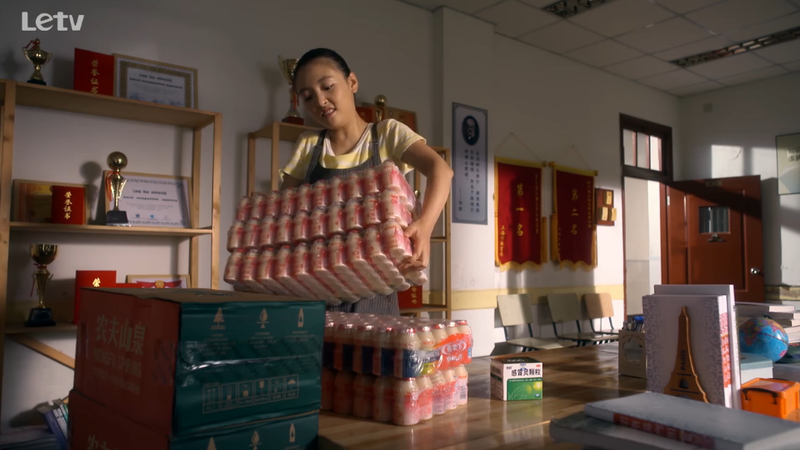 It isn’t without benefits, because Yi Chen drops off some 999 cold medicine for her since he noticed her coughing in the cafeteria. Hehehehehehehehheeh. Uh, don’t mind me! I’m just going to go to a corner and squeal. forty boxes coming right up! It’s sure rains a lot in Shanghai because it’s raining again. And without fail, Mo Sheng bumps into Yi Chen on campus as well. 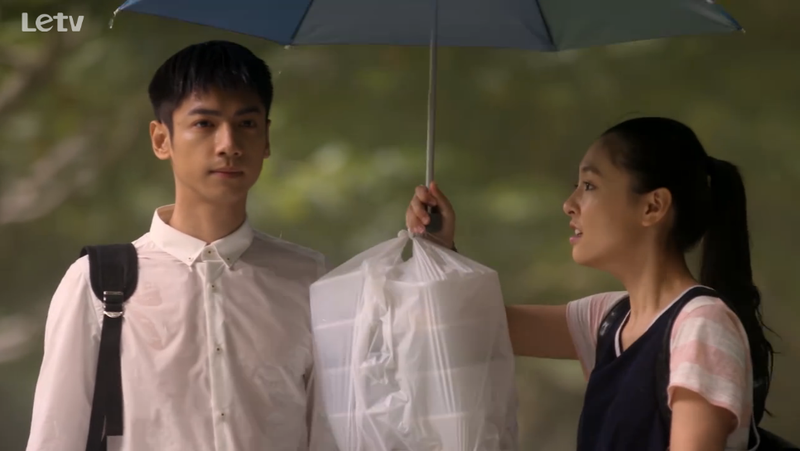 He doesn’t have an umbrella so Mo Sheng suggests that she retrieve one from her dorm. He gives her the cold shoulder and tells her again that she doesn’t need to do this because it’s just a waste of time. Mo Sheng returns to her dorm to find Xiao Xiao all covered in dirt and bruises. Upon inquiring, we learn that Xiao Xiao got robbed by some dude after coming home from her evening part time job. Everyone tells her to quit, but she says she must work, so Mo Sheng tells her she will go with her. Since Mo Sheng must wait for Xiao Xiao to get off work, she misses a couple of debate club meetings, and Xu Yin jumps on it with too happy a face. So what does Yi Chen do? He gets up suddenly and abruptly leaves the meeting. Where does he go? Supposedly to his internship, but he is probably itching to see Mo Sheng. Sure enough, he finds Mo Sheng inside Traveled Coffee taking pictures of a cake. He sighs in disappointment and goes inside. She asks him why he is here and he returns the question. She swears to him that she is here waiting for Xiao Xiao to get off work and not because she was following him around. Yi Chen glances at the cake and comments that the cake is probably more expensive than Xiao Xiao’s salary. Mo Sheng says it’s okay, she told Xiao Xiao that she’s here taking after school classes and gets free hot water. Oh Mo Sheng, lol. 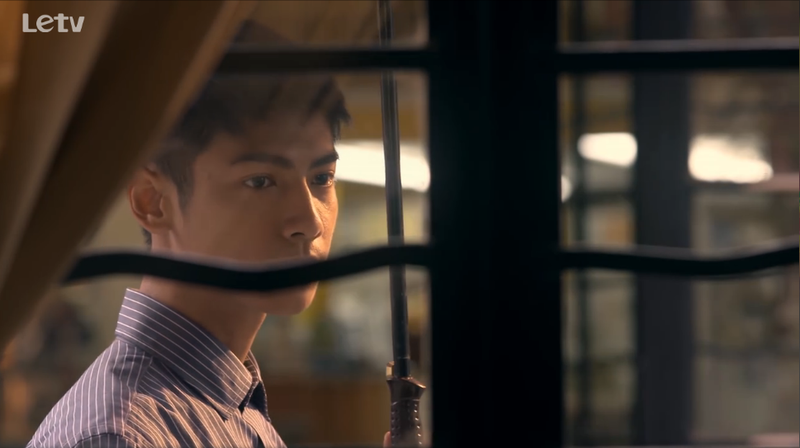 ‘Tis another day and Mo Sheng runs into Yi Chen again outside of the coffee shop. Yi Chen immediately scolds her for missing the debate club, and even tells her that he had voted for her acceptance (to her surprise) so if she doesn’t go, he will feel awkward. She then wonders what would Xiao Xiao do, so he suggests that he can walk home with Xiao Xiao. Mo Sheng asks if he actually likes Xiao Xiao’s type, but he says ‘no’ so she feels assured. Nothing is as planned though because Xiao Xiao comes back to the dorm unexpectedly and tells everyone that she quit. Mo Sheng goes with Xiao Xiao to beg the boss for her job back, but the boss doesn’t bite because he found someone else already. So does Mo Sheng let Yi Chen in on this information? No way! 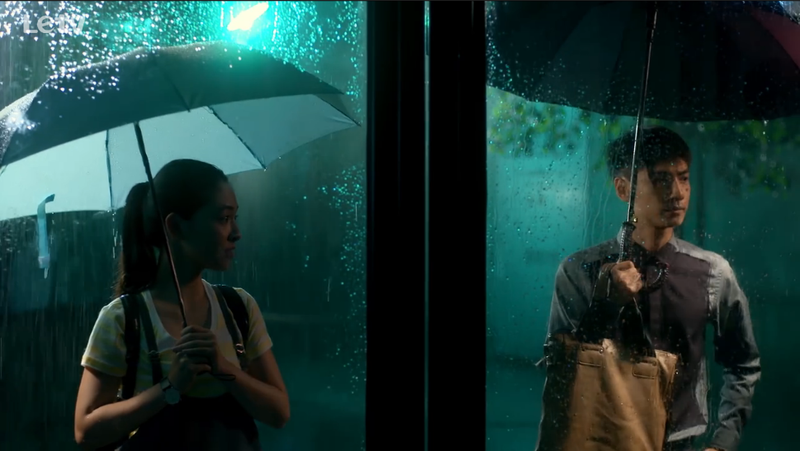 Yi Chen is not one to break his promise, so despite the pouring rain he still goes to his intern job (the office is the one he takes later) because he is meeting up with Mo Sheng. Oh la la. He shows her a room for her to wait for Xiao Xiao (he even requested his supervisor for the room!). So Yi Chen settles into his cubicle, and Mo Sheng starts to study. Suddenly some crippled dude knock on the door screaming to see Lawyer Mao. Yi Chen explains that the lawyer is not there, but the dude doesn’t believe him. The man says the lawyer is a cheater and lied to him and told him he can get financial support for legal fees, but because he lost the case the lawyer just took the money. Yi Chen tells him lawyers aren’t supermen and can’t do everything. Yi Chen also was able to identify the man and tell him that Lawyer Mao is actually still working on the case. In fact, he found new evidence and will contact him in a few days. The man nearly collapses in gratitude and they send him away in a taxi. Before the man leaves, Mo Sheng hands the man an umbrella. So it is only natural that Yi Chen asks Mo Sheng what is she going to do with no umbrella (share with you, duh!). She says it’s okay because the rain might stop later, but he points that she just said it won’t stop. She tells him its okay because she is young and that that man is in a more desperate situation. Yi Chen laments that there are a lot of desperate people in this world but he cannot do enough. She comforts him by saying helping some people is better than not doing anything at all. They share an intense moment of gazing into each other’s eyes. Hehehe. Yi Chen quickly diverts and asks if Xiao Xiao is done yet. Mo Sheng calls her roommate and “finds” out that Xiao Xiao is already home. So Yi Chen accompanies Mo Sheng back, and it really does stop raining! When they get to her dorm, she confesses that she lied but asks him to go easy on her because she confessed. He says that only works with police. He takes his leave, not forgetting to tell her to not follow him. But he totally smiles as he walks away! Thinking that he is mad at her, Mo Sheng goes to apologize to him at the library, but he says this is not the place to talk. She gives him two yogurt drinks and he says, with all seriousness, that he wanted to tell her something for a long time – don’t drink too much of non-water drinks or else she will become stupid. At the debate club meeting, Xu Yin sees Mo Sheng and is just about to tell her leave, but Yi Chen interrupts and says he is the one who told her to come. Xu Yin gets upset and says this is not the place to date and Mo Sheng can’t contribute to the club because she has no talents. The President also comes to Mo Sheng’s defense and says she can help take members’ photos because Xu Yin’s photos turned out awful last time. HAHAHAHHA. D-day has arrived! The debate team is out for a competition and Mo Sheng asks Yi Chen to save her a seat toward the front. She also uses the excuse that she needs to put away luggage to ask him to take her bag. And he totally obeys even though he gives her this “I can’t believe you” face. Yi Chen is feeling uncomfortable at the competition because of the bad skewers he had with his roommates the night before. Mo Sheng thinks its her fault for tossing her bag at him too harshly. Xu Yin blames Mo Sheng again (of course). Things make a turn for the worse at the competition because Yi Chen can’t find his notes! Xu Yin points her finger at Mo Sheng again because she held onto Yi Chen’s bag earlier. Even though Yi Chen thinks he lost his notes in the bathroom, Xu Yin is still determined to blame Mo Sheng. And so Yi Chen says anyone who needs notes to win is not a real champion. What a man! Now the competition begins! 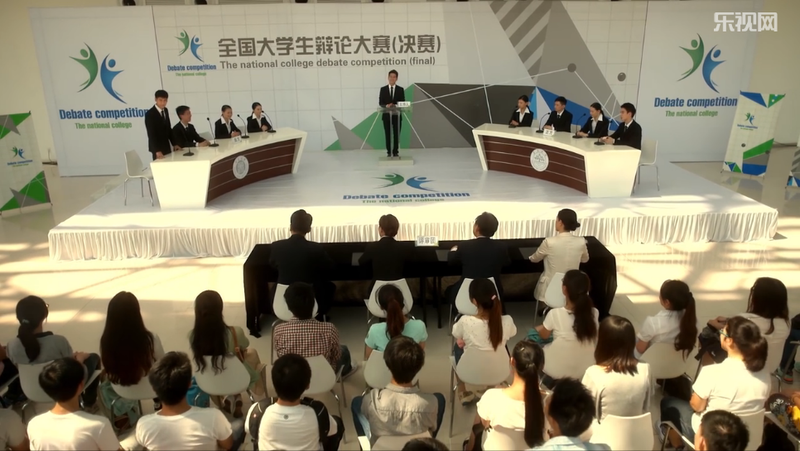 The debate team takes center stage and Xu Yin is not even up there with them so I don’t know why she’s all up in everyone’s face about contributing. Correction, all up in Mo Sheng’s face. Anyway, just as it look like the other team is winning, Yi Chen comes up with some super brilliant points and he even cracks a joke, but just then his face… the expression changes. What happens next? Find out in episode 5! just to see mo sheng? 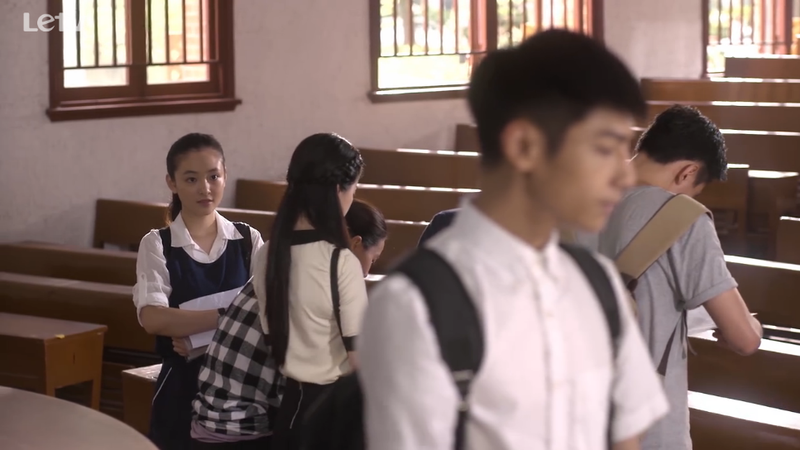 Mo Sheng bumps into Xiang, an upperclassmen who is friends with Yi Chen. I bet Xiang is one of the three partners of Yi Chen’s law office later. He encourages her to keep going! Yay! Mo Sheng and Xiao Xiao walk home together and pass by the law school. Xiao Xiao teases her that she is just there to see Yi Chen. A bunch of other male members hide outside the window when Xu Yin lectures Mo Sheng. Some of them pop up to remind her that they have never heard of no dating as a rule, and if it is a rule, then she should obey it first. Mo Sheng and Xiao Xiao walk home together and share the two rejected yogurt drinks. Mo Sheng remembers Yi Chen’s comment and says maybe she shouldn’t drink it, but Xiao Xiao says if she is to turn stupid they have to together! Ah, true sisterhood. Mo Sheng promises to take a great picture of Yi Chen at the competition, but he tells her it’s okay as long as she can take normal photos of him. LOL. 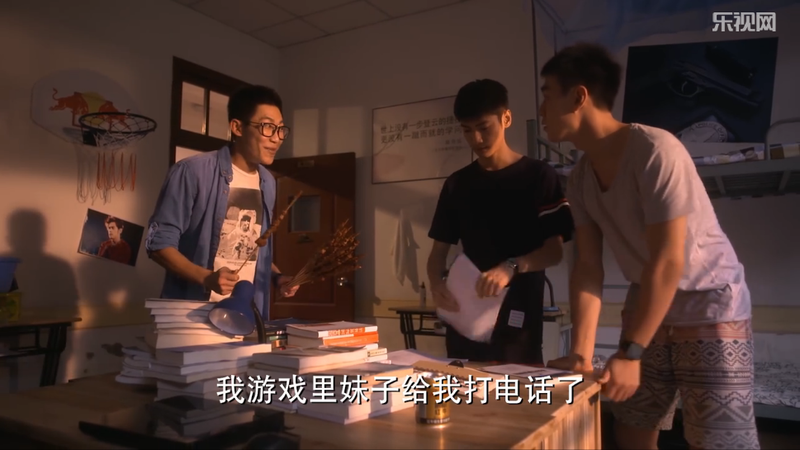 Yi Chen and his roommates eat some skewers and his roommates both have tummy aches, but he is fine, well, until the next day? is it just me or that of all the girls who have a crush on Yi Chen, only Mo Sheng have the courage to confront him about it. It was no wonder he chose her. Everyone else is a coward who pick at the girl who won behind his back. Yup! It makes me wonder why nobody else tried to confess to Yi Chen. Maybe that would be all it takes to get together with him! Alternatively though, if he didn’t like Mo Sheng, I can imagine how annoying he would find her lol. I don’t think he would really feel anything if he doesn’t like her. he would treat her the same way as he treated that debate club president that also crushed on him. I think it’s the part of him recognizing her as his mate that’s opposing her at first. lol. Once he accepted, like after they started dating, it became the quality he loves most about her.